For the past three years, Test Kitchen has been feeding Hong Kong’s insatiable appetite with a steady stream of up-and-coming chefs from around the world. They’re drawn by the unique platform which allows creative cooks to dream up imaginative, no-holds-barred tasting menus and test them out in one of the world’s culinary capitals. Founded by Vincent Mui in 2015, Test Kitchen’s hotly anticipated pop-ups have become a steady fixture in the local dining scene, from Toni Kostian of Grön‘s minimalist Finnish fare, to fiery Malaysian eats courtesy of Dewakan, and sunny farm-to-table Sonoma dishes from husband-and-wife duo Daniel Kedan and Marianna Gardenhire of Backyard. Chef Devon Hou is the culinary head of Test Kitchen, tasked with assisting visiting chefs in executing their pop-up menus. These chefs and their teams fly in to Hong Kong for 3–5 nights to present a condensed snapshot of signatures from their restaurants, peppered with one-off dishes often inspired by trips to the wet market as well as Hong Kong’s access to a wide array of premium global ingredients. 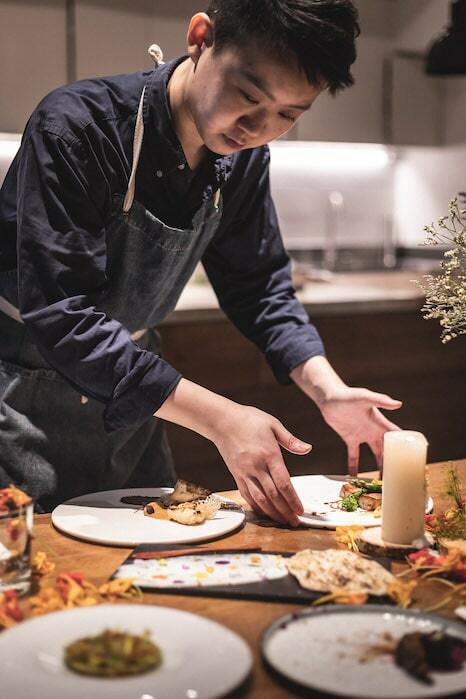 To help fine-tune their menus and source their ingredients, they turn to homegrown culinary talent Devon Hou; as Test Kitchen’s head chef, she’s instrumental in ensuring the popular pop-ups run smoothly, from gathering all the ingredients to facilitating service during dinners. This month, chef Hou is hard at work honing her own menu, as she prepares to present her own culinary point of view for the first time at the next pop-up dinner running from 24–27 April (HK$980 per person, purchase tickets here). 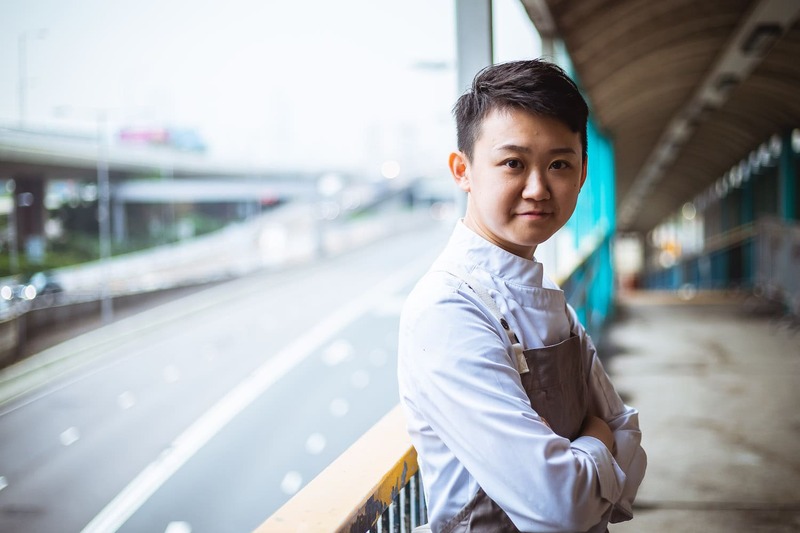 In addition to getting a crash course in global cuisines at Test Kitchen, Hou’s impressive CV includes working at two of Hong Kong’s most renowned restaurants: Amber and Tate Dining Room. We recently grabbed a few moments with the budding talent to chat about her personal cooking style and what we can expect from her first Test Kitchen showcase. Chargrilled octopus with smoked paprika cherry oil stars on Devon Hou’s upcoming spring-themed menu. Tell us a bit about your background and what drew you to becoming a chef. Looking back, the person who played a significant role in inspiring, teaching and making me falling in love with cooking was my economics teacher, Miss Chiu, in secondary school. After graduating, I applied for many jobs. One of the most famous restaurants here, Amber, hired me — this fundamentally made my career path much smoother, and it’s where everything started for me. Over the next 15 years, I took small successive steps, and that allowed me to accumulate the cooking skills and artistic instincts that I possess now when I cook. 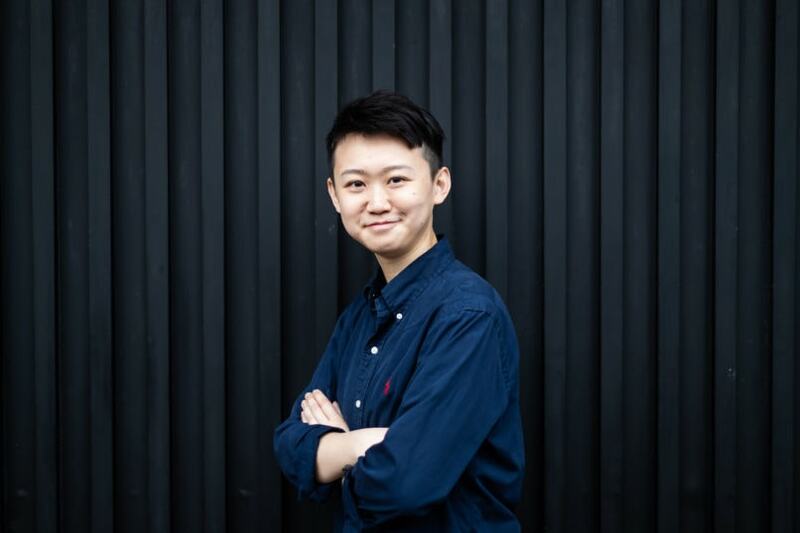 You've worked with both chef Vicky Lau at Tate Dining Room and chef Richard Ekkebus at Amber. Do you consider them to be your biggest mentors? They’re definitely my main mentors as I’ve worked with them for more than three years. Other chefs from whom I’ve learnt a great deal from are chef Michel Del Burgo from L’Atelier de Joel Robuchon, chef Uwe Opocensky from Mandarin Oriental, chef Gray Kunz from The Upper House, and also chef Nacho del Campo from Camino London, where I worked for two years during my stay in the UK. 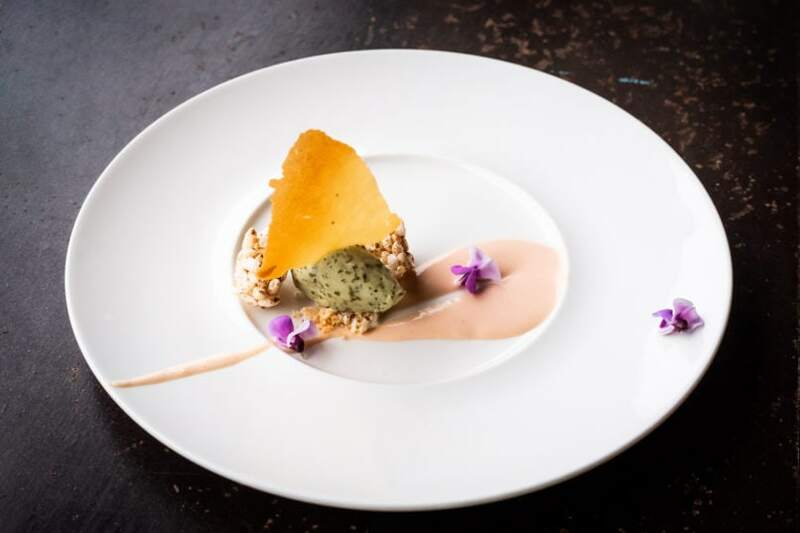 Japanese ingredients strongly influence Hou’s cooking, such as in her shiso ice cream with peach tuile. What was your biggest takeaway from working at Tate and Amber? To put it in the simplest way: Attention to details and focus, lead and follow. Respect everyone and show mutual support. I would describe my food as using French cooking techniques, with Spanish and Japanese influences, to create plates full of character. What can we expect at the upcoming Test Kitchen pop-up? Tell us about some of your signature dishes. A strong feeling of spring, which is one of my favorite seasons because of the abundance of amazing fresh, seasonal ingredients available. 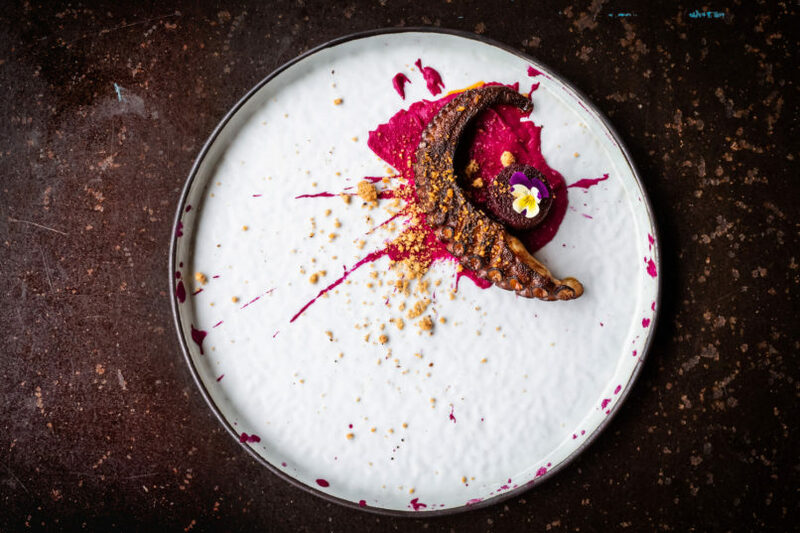 Look out for the grilled octopus with beetroot, sherry paprika oil and porcine crumble — it’s one of my signature dishes that’s always on my menu. This time I’m using a new combination to refine this dish, so there’s more texture and complexity in flavour. One of the more experimental dishes is fregola with asparagus, sakura ebi and parmesan cheese. There is a surprise secret ingredient in this dish that is not mentioned on purpose, and I’m looking forward to revealing it during the pop-up as guests are finishing the dish. What do you hope diners will take away from your menu? I hope that diners can experience a new level of fusion between local, Japanese, Spanish and French ingredients, cooked in a way with different combinations you won’t often find in Hong Kong. Expect something truly original. Chef Devon Hou steps out from behind the scenes at Test Kitchen. You also serve as the head chef at Test Kitchen, assisting the chefs who visit from overseas. What does that entail? There’s actually a lot of preparation to do for each pop-up. Besides assisting the chefs during the actual cooking, I spend a lot of time getting the best ingredients for the pop-up, and at times it’s challenging when the ingredients are not available locally, or when we can’t import it in a short period of time. Then the fun begins as well, where I’ll come up with substitutes which have the same or even better quality and still match perfectly with their menus. In turn, this also inspires me for my future creations in terms of ingredient combinations. Why do you think Test Kitchen is important, and what role do you see it having in our local dining scene? The concept of Test Kitchen is relatively new in Hong Kong’s F&B scene. Having different top chefs come to our city not only brings different dining experiences to our customers, but it’s also about experiences and cultural exchange among local and overseas chefs. It’s the most organic way of diving into each other’s culture through food. As a homegrown chef, why is it important to you to champion Hong Kong chefs, ingredients and cuisine? Chinese cooking is dominant here, and with our busy lifestyle, fast-casual Chinese food (for example, cha chaan tengs) often becomes our go-to fast dining option. When people want to have a nicer or fine dining experience, many opt for Western cuisine. However in my opinion, we can do a lot more by creating our own refined dishes and cuisine with local ingredients. This is not just a trend, it’s the way cooking around the world is headed for the future. The next Test Kitchen pop-up with chef Devon Hou runs from 24–27 April, priced at HK$980 per person plus HK$480 for wine pairing. Purchase tickets here.